Early in 1896 Harry J Lawson established the English Daimler Company at the 'Motor Mills' in Coventry and soon created another business, the Great Horseless Carriage Company, also to make cars. In 1898 the GHCC became the Motor Manufacturing Company. Daimler and MMC vehicles shared the same mechanical components, but MMC also made motor tricycles, and De Dion-type engines that were sold to other makers. In 1902 works manager George Iden rationalised MMC's output with only three types being made: single, twin, and four-cylinder models all having the same engine bore and stroke and interchangeable components. These were good cars and for the next two years production ran at some 350 vehicles per annum. 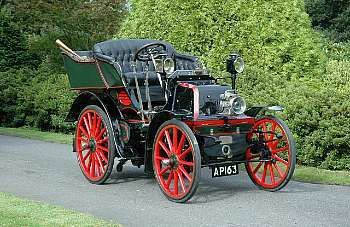 However, in December 1903 Iden resigned to make cars under his own name at Parkside, Coventry, and MMC began to falter. Cars continued to be available in 1905 but at the end of the year Daimler bought MMC's space at the Motor Mills. Daimler prospered but its alter ego the Motor Manufacturing Company just gently faded away.